As a 19 year-old naïve girl going through a rebellious time, I found myself pregnant. I had been challenging my family at every turn; I turned my back on them, and just knew I knew everything. Then reality hit. I was in the most unstable and unhealthy relationship I could ever imagine having and wound up pregnant. I was raised to be a good, Catholic girl. I went to Church every Sunday, I believed in God, I knew He was real, and yet I betrayed Him in the worst way I could. I got pregnant before marriage, which was sacred to me. I was scared. I was terrified to face my family, to admit my wrongs and to ask for forgiveness. I never wanted sympathy; I put the full responsibility on my shoulders. As my family found out, they quickly brought up the idea of adoption. In 100% honesty, I was initially offended at the idea of adoption. I wanted my baby. I wanted to raise him. I knew I could give him some sort of life, but in my heart I knew I couldn’t provide everything he would need. I could provide love and faith, but I didn’t have a stable home, income, or insurance. Therefore I couldn’t provide him with a safe home, medical care, a good education, sports, swim lessons and so on. Young and stupid as I was, I knew that my baby, the person I created, deserved the world. It took a few months, but I finally decided to look into adoption. I sought out a couple different agencies and began really discussing the option with my mom. Abortion never crossed my mind. I created this tiny human and I would be giving him life, and through adoption, I’d be giving him a better life. The agency sent a woman to my home to discuss what my requirements for an adoptive couple would be. I had a few things that I wasn’t willing to budge on. Really, I wanted it to be like a fairytale; like I would see a couple and just ‘know.’ I told the agency that I wanted to see all of the practicing Catholic couples, those who had been married for a significant amount of time, and the couples that were financially stable enough to allow my son the life I simply couldn’t provide. The next visit, the agency lady brought a pile of about thirty profiles that matched my desires. She slid them across the table to me and began explaining some of the couples that she had researched, but she didn’t need to. The very first profile on the top of the pile was a beautiful couple; a young, ambitious couple. Basically, the fairytale I’d hoped for. The wife, Kristy, had this smile and an “I was born to be a mom” glow. Joe, the husband, was full of a contagious confidence that I could feel radiating through the pictures, and through their words, I just knew he would be my sons’ dad. The adoption caseworker told me not to make a quick decision; to take my time and read through every couple’s profile and then we would set up a meeting. But I didn’t need time! The next morning I emailed her and said, “I need and want to meet Kristy and Joe. How soon can we do this?” So, on August 26, 2010 we met up for lunch. The connection was definitely there, and I confirmed that I just knew. From that point on, I didn’t feel a need to look further. I invited Kristy and Joe to doctors’ appointments, in which at least one of them would always attend (even with a two-hour drive each way!) I went into labor several different times, but on October 19, 2010, our son took his first breath at 10:07 p.m. Seconds after he was born, Kristy and Joe came into the room to cut his umbilical cord. Surrounded by both my sisters and my mother, we welcomed them to meet their baby boy. It was tragically beautiful. My heart was ripped to shreds and it felt as if I couldn’t breathe. I thought I was going to die from the heartbreak and love I was experiencing altogether, but looking at Kristy and Joe who were crying their eyes out in joy and admiration of their new son, I knew everything was as it should be. Now our son is five years-old. He is perfect, he is handsome, and he is loved. He has so many people that love and adore him, many of whom he’s never met. He is an inspiration to many, and he is my hero. I am so pleased that he is growing up exactly as God intended, and I thank Him every day for adoption. I am now going to school, studying social work, and hoping to become an adoption counselor someday. My favorite thing is talking about adoption, talking about my son (as any proud mom does), and helping other women and girls seriously explore the option of adoption. Advocating for adoption is my top priority. 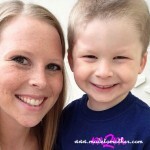 Originally, I believed the stigma “she gave her kid up for adoption. She gave him away, she clearly doesn’t care about him.” I believed that until I became a mother, when I realized that being a mother means you do what it takes to provide your child with the life he or she deserves. You put your child first, you don’t think of yourself anymore. Adoption is a wonderful thing; it provides a new love and a new life to everyone involved. I am still very active in Carson’s life, and I have Kristy, Joe and open adoption to thank for that. Adoption doesn’t make you weak, it doesn’t make you a bad mom, and it certainly doesn’t mean you didn’t want your child. It is a testament to how much you love and value your child. So much so, you forget about yourself and only put him or her first. There are so many “Kristy and Joe”s still out there. So many eager couples desperate and destined to become parents. They will treat your child like royalty; they will treasure them as you would. Adoption and birth mothers are not about being defeated; rather, it’s a victory. New families merge and bonds are made that will never be broken. Rachel lives in Midland, Michigan while pursuing her Bachelor’s degree in social work, before moving on to her Masters. She has been blessed with two incredible, perfect nephews and a beautiful, precious niece that are her world. Rachel also has a wonderful family and a long-term boyfriend for whom she’s extremely grateful. You can read Kristy and Joe’s story, also featured this month, here.